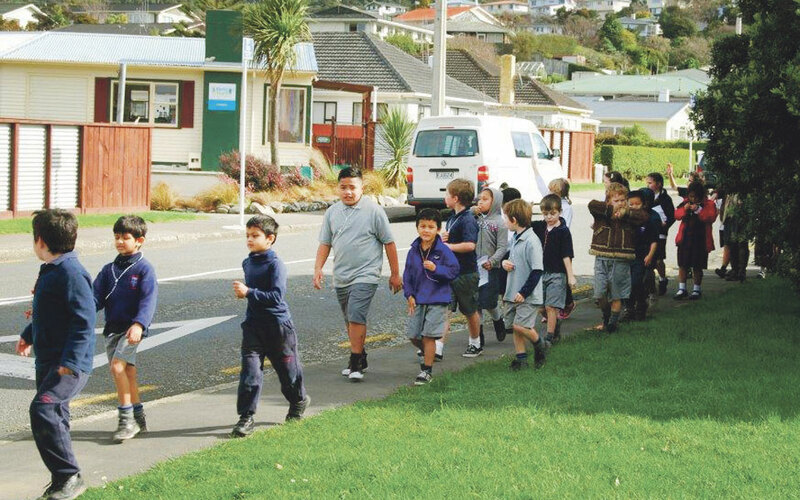 Pupils, staff and families from St Francis Xavier school Tawa celebrated the Feast of the Assumption on 15 August with a special pilgrimage. The 175 students took to the streets with rosary beads around their necks, carrying the school banner, praying and singing hymns. The faith walk included McKeefry Grove, Lane Crescent and Redwood Avenue, named after former archbishops and one of the first priests to serve in Tawa. The children passed the home of George Boderick who helped build their school and hall. At Our Lady of Fatima parish church, parish priest Fr John van der Kaa spoke about the feast day and gave them a special blessing. The group then continued on to the original Catholic church building and presbytery in Rewa Terrace. On the way back the pilgrimage stopped near the site of the old Ryan homestead. The Ryans were the first Catholic family in Tawa and Fr John Joseph Lane from Lower Hutt used to celebrate Mass in their living room. The Faith walk was a wonderful opportunity for the children to learn about and appreciate those who have gone before us and to show our faith to the community.